Thank you for your interest in the MnTAP intern program. 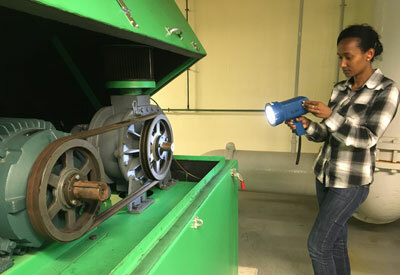 The Minnesota Technical Assistance Program (MnTAP) seeks junior or senior college students to work on waste reduction, water conservation, lean manufacturing, and energy efficiency projects at companies in Minnesota each summer. MnTAP plans to support 15 projects in 2019 at locations around the state. The projects are at different companies and in a variety of industries. City of Plymouth, Plymouth, MN – Lead a project focused on water conservation and bench marking at a local municipality. Kerry Ingredients & Actives, Rochester, MN – Lead a project focused on industrial wastewater treatment optimization, product loss minimization, and water conservation. Project at a Food Processing Facility, Fridley, MN – Lead a project focused on water conservation at a local food processing plant. Seneca Foods, Glencoe, MN – Lead a project focused on process water conservation and product recovery at a food processing facility. Wenger Corporation, Owatonna, MN – Lead a project focused on scrap reduction and energy efficiency. ***FILLED*** Aveda Corporation, Blaine, MN – Lead a project focused on process water conservation and efficiency in the manufacture of personal care products. ***FILLED*** Ball Corporation, St. Paul – Lead a project focused on water conservation at an aluminum can manufacturer. ***FILLED*** Boston Scientific, Maple Grove, MN – Lead a project focused on water conservation at a medical device manufacturer. ***FILLED*** Health Systems Cooperative Laundries, St. Paul, MN – Lead a project focused on water conservation and energy efficiency at an industrial laundry facility. ***FILLED*** Hutchinson Wastewater Treatment Facility, Hutchinson, MN – Lead a project to optimize nutrient removal in wastewater. ***FILLED***Minnesota Technical Assistance Program, Minneapolis, MN – Lead a project to optimize nutrient removal in wastewater treatment ponds. ***FILLED*** Minnesota Zoo, Apple Valley, MN – Lead a project focused on water conservation and wastewater reduction at a zoo. ***FILLED*** North Memorial Health Hospital, Robbinsdale, MN – Lead a project focused on energy conservation at a community hospital. ***FILLED*** Phillips Community, Minneapolis, MN – Lead a project focused on improving air quality in restaurants and child care facilities. ***FILLED*** Verta Inc, Delano, MN – Lead a project focused on improving paint transfer efficiency.